The case for enfranchising EU citizens in the UK for a People’s Vote. 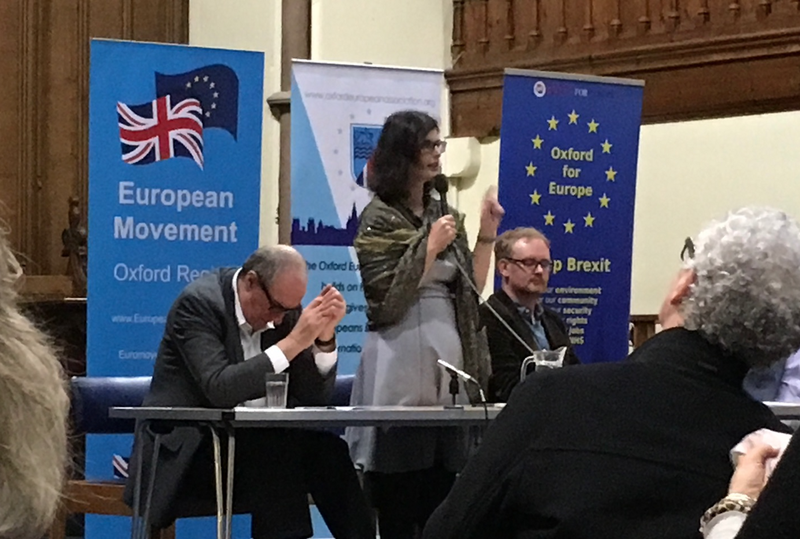 On 6 December, I was at a People’s Vote event at Oxford for Europe (pictured below), on how to campaign to win hearts, minds, and votes if a referendum on the deal (a “People’s Vote”) were to be held. One disappointing feature is that the option of enfranchising EU citizens resident in the UK for this vote was dismissed out of hand as impractical. So, let me try to push back and debunk some of the more common arguments for why it can’t be done. 1. There isn’t enough time. The idea that there wouldn’t be enough time to change the franchise is strange, given that the not enough time argument is also used to say we can’t hold a second referendum before March 2019. Given how in politics these days a week is a year, if you have enough time to organize a People’s Vote, you have enough time to enfranchise EU citizens. We’re registered to vote for local elections. It’s not rocket science. 2. EU citizens in the UK are not British citizens. Being a British citizen isn’t necessary or sufficient to vote in parliamentary elections. Irish citizens can vote. Commonwealth citizens can vote. On the other hand, UK citizens resident in the EU for over 15 years cannot vote. Now that’s clearly an unjust situation given how the Referendum has affected them, they should get a vote too. The argument for why Irish and Commonwealth citizens get to vote is “close ties”, but if organizers of a People’s Vote are serious about the European project, should they then not, by the same reasoning, give EU citizens in the UK a vote too? Over 40 years of tight political integration surely would be of a similar if not higher level of ties as the Commonwealth. Thinking the ties of someone say from Malaysia or Canada are closer is just undiluted Empire thinking, but does not reflect an economic, political or social reality. Note, I’m all for the franchise for Commonwealth citizens living here. Anyone living here long-term should be given a vote. For one thing, if you are a tax contributor but cannot have a say on how those taxes are spent, you get the situation that you become the topic (“End free movement!”, “Make a really hostile environment for immigrants”) rather than a participant of a vote. 3. To be valid, a second vote should have the same franchise as the first. The franchise cannot be identical anyway because a cohort of people who were too young to vote in the 2016 referendum can now vote, and some voters have died. A record number of EU citizens have — at great expense and effort — become British citizens following the EU referendum. Moreover, the EU Referendum was riddled with features that impeded a well-informed, free and fair vote. The numerous lies peddled about the EU, the deliberate misrepresentations (e.g., focusing on absolute numbers obscure the fact that UK tax spending to the EU is only 0.7% of GDP), the electoral overspending, and fraud. Should we repeat all these features so as to replicate the first referendum? What has less attention is that the franchise was deliberately chosen so as to make a Leave vote more likely. I recall smug tweets by Daniel Hannan and the likes about how happy they were with the franchise. Cameron and others went along because they thought they would win anyway. In fact, the franchise was deliberately chosen so that people who stood to lose most from this vote — EU citizens in the UK and long-term resident UK citizens in the EU — could not vote. If we want a fairer vote, we should aim for a fairer franchise. 4. It would not be democratic to now enfranchise people. Enfranchising people is the opposite of being undemocratic, it is being democratic. You can’t on the one hand celebrate the suffragettes and on the other continue policies that deliberately disenfranchise people. Political theorists such as Jean Jacques Rousseau, the inventor of the concept of “will of the people” or general will, argued that people most affected by a vote should have a say in it. Otherwise, it is not truly the will of the people. 5. Enfranchising EU citizens at this point would be seen as a betrayal. The very idea of a new referendum, regardless of franchise, might be seen as a betrayal. But in order to stop the betrayal narrative, campaigners for a People’s Vote should not try to soften the pill. Rather, they should resist the “betrayal” narrative. Who was betrayed with Brexit? EU citizens felt betrayed by the UK which callously first used them as bargaining chips and is now set to water down their rights. Vote Leave promised, infamously, that nothing would change for EU citizens resident in the UK, they would be granted automatic leave to remain and would not be treated less favourably than they are at present. Settled status, however, is a watering down of rights (especially in the event of no deal), and you are not automatically granted it. You have to apply for it. Philosopher & Associate professor. Educator. Apparently still a bargaining chip for the UK government. Indulging the Brexit intolerance is shameful and immoral — A response to the ‘Norway reports’. Staring into the Abyss: Citizens’ Rights after a No Deal Brexit.